She began blogging in 2005 (whoa!) to catalogue and support her weight loss efforts. She lost 70 pounds, has kept it off, and has been featured in a ton of places – most recently she had a page in Ladies Home Journal. If you aren't reading her blog, you click over there and start following her. Why do I love Roni? She lost the weight by eating healthy and changing her habits. Her recipes are accessible and delicious – and she includes Weight Watchers Points Plus for WW members. She uses a ton of fruits and vegetables and I asked her to share this salad because it is one you can create from food that is stored in your pantry – no fancy ingredients – and it is SO tasty. This is going to sound funny because I’m sharing an idea that uses three canned food items, but the more fresh foods I keep on hand the more inspired I am to whip up dishes. With the addition of my herb garden (which is really flourishing), I’m making an effort to keep things like fresh garlic, lemons and limes on hand. I don’t want to admit it, but juice from a fresh lime is WAY different than the bottled stuff. Same with garlic! So I guess this idea is how I used a few fresh ingredients to really liven up some pretty basic pantry items. Those things combined made up the tastiest salad ever! I ate it all weekend, finally finishing it off Saturday night and I’m making another batch today to bring to a party (we’re getting together to watch the USA soccer game tonight!). 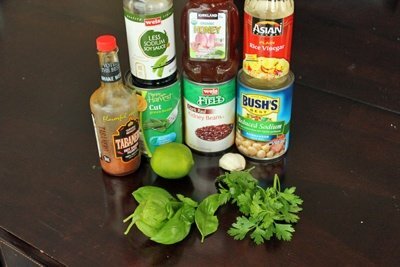 Put everything but the beans in a large bowl and whisk to make the dressing. Put everything but the beans in a large bowl and whisk to make the dressing. Add the beans to the bowl. Toss! Enjoy immediately or refrigerate for later. This is great salad. I always buy a couple of lemons, garlic and parsley each week too. I buy canned organic beans as well as dried however green string beans are either fresh or frozen. Has anyone seen "Forks Over Knives"? I like to rewatch it every so often. Such life altering scientific information. Griz: re: herb gardens...some info, tried and true I can share for my Mass. area is: herbs like sun (8 hours), rich soil (compost your vegetable and fruit peelings - no big deal, a pile in a corner of your yard will suffice) chive and sage will 'winter over;' buy parsley -either broad leaf or curly from garden store; also basil. Basil LOVES water. Never let the soil get dry and the more you pinch off the more you get. This is absolutely my favorite kind of bean salad. This is a great recipe and looks even better than my goto recipe. Thanks! Thanks Marlene. I will try your suggestions and let you know how it went. I love 3 bean salad and can't wait to try this Asian inspired variation. Thanks Roni + Lisa! This is one of my favorite recipes you have ever featured! I make it for every party/pot luck and my family insists I make it for every holiday meal. 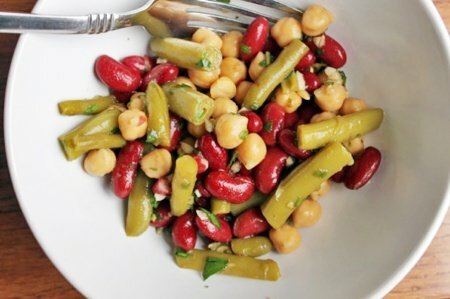 It's so simple and easy, and even people who have never had bean salad or don't usually like it love this one, including myself! :) plus having fresh herbs is great. Whatever I have left over I usually just throw it into something else I'm making and it turns out awesome. I maybe made it wrong? I thought it was wayyyyyy too much vinegar.